Feb 4 (AZINS) Days after courting controversy over a list of 51 women who had entered the Sabarimala temple, the Kerala government Monday said only two women of menstrual age had visited the shrine after a Supreme Court's judgement removed the bar on their entry. In a written reply in the state assembly, the government also said the visit of a Sri Lankan woman in early January was yet to be confirmed.Devaswom Minister Kadakampally Surendran, in response to an unstarred question, said two women had offered prayers at the Lord Ayyappa shrine according to the report of the temple executive officer.He also said they were awaiting confirmation on whether Sasikala, the 47-year-old Sri Lankan woman whose visit was earlier confirmed by sources in the Chief Minister's Office and police, visited the hill shrine. Surendran was replying to a question by opposition Congress legislators on how many women in the age group of 10-50 years had offered prayers at the temple after the September 28 apex court verdict.The CPI(M)-led state government had filed an affidavit in the apex court on January 18, saying 51 young women had entered the temple during the recently concluded annual pilgrim season.However, controversy erupted later as some women who were named in the list were above 50 years of age. Names of at least two men had also crept into the list. In response to another question, Surendran said the authority to take a decision on matters related to the shrine's customs and traditions was not entrusted with the temple's 'tantri' (head priest) alone.According to the Devaswom Manual, if any violation of traditional customs occurs, it is for the officials of the Travancore Devaswom Board (TDB) to hold talks with the head priest and take a final decision on atonement rituals, he added. Last month, the head priest, Kandaru Rajeevaru, had closed the sanctum sanctorum of the shrine to perform a 'purification' ceremony after two women offered worship at the temple.The TDB, the apex temple body in Kerala, has sought an explanation from him.The annual pilgrimage season witnessed widespread protests from frenzied devotees and right-wing groups over the LDF government's decision to implement the Supreme Court's verdict, allowing women of all ages to enter the hilltop shrine. 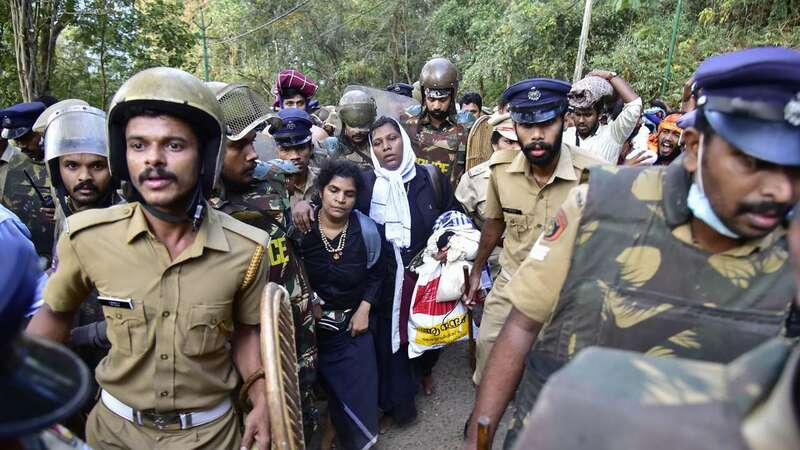 During the season, over two dozen women devotees, some of whom were branded as activists, unsuccessfully attempted to trek the hill.However, on January 2, two women, Kanakadurga (44) and Bindhu (42), offered prayers at the shrine, breaking a centuries-old tradition.Before the Supreme Court's verdict, women in the age group of 10 to 50 years were not allowed to enter the temple as the presiding deity, Lord Ayyappa, is a "Naishtika Brahmachari" (perennial celibate).